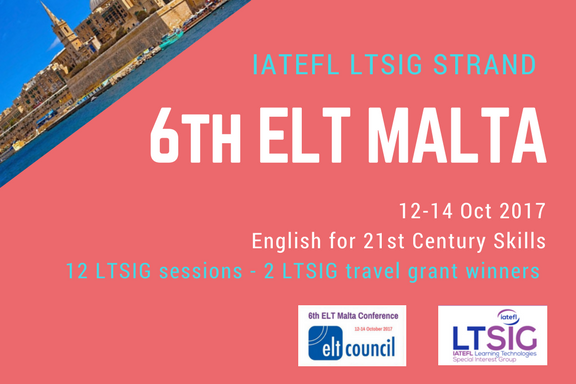 The IATEFL Learning technologies SIG is pleased to announce its prominent strand at the 6th ELT Malta Conference, English for 21st Century skills, to be held between 12-14 October 2017. Confirmed plenary speakers of the conference are Sarah Mercer, Penny Ur, David Nunan, Andy Hockley and Robert McLarty. See the programme and registration forms below. Twelve proposals for the LTSIG strand have been accepted. Calls for proposals for two travel grants were issued for the LTSIG strand and we received dozens of great proposals. See our travel grant winners and list of speakers below, along with links to featured interviews. More interviews to come soon, so stay posted for updates on social media. Follow our website and social media channels for more updates on speakers and LTSIG members participating in this event! Please use the hashtags #LTSIG #ELTmalta to locate our content and take part in this.